"No Borders", "No Styles", "No Categories", "No Ages". The 4 "N's", which means "to be beyond", has been the name of tableware series by Noritake, and it can be said that this series is the new "paramount piece of work" by Noritake Co.,Limited, who has built up Japan's tableware manufacturing industry and has been leading the scene since 1904 (Meiji 37). 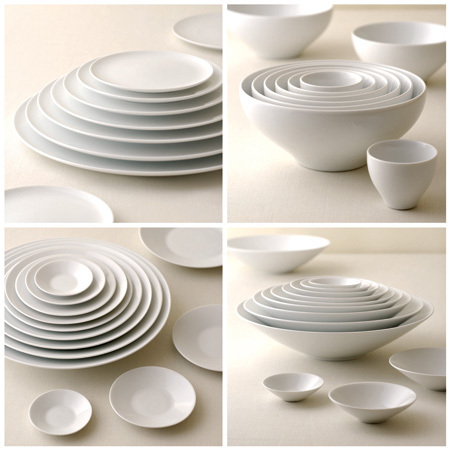 The theme of the form is focused on "circle", and the concentric circle pattern is made of white porcelain and is eliminated of any decoration. The extremely simple, yet nimble and refined design is not just born from the need to "adapt to the wide variety of food". The freedom to match, the ability to be stacked up, and the ease of maintenance and storage; with the ability to adapt to various users and usages (people who enjoy wine and dine, people who work behind the scene, the place and occasion), the N4 series achieve the universality which touches the essence of lifestyle that revolves around food by "transcending the limitation that bounds food". The same attempt can be seen in the functionalist designed dishes and pre-modern iron cooking pots (kosher foods) of the 30s to the 50s in Germany and Scandinavian countries. However, the N4 series goes beyond them by being a product that can be accepted and appeals to Japan and the world of 21st century in both functionality and aesthetics, thus the term "paramount piece of work" is appropriate.